The KRK Rokit 5 Generation 3 Powered Studio Monitor takes the industry standard Rokit series to the next level! 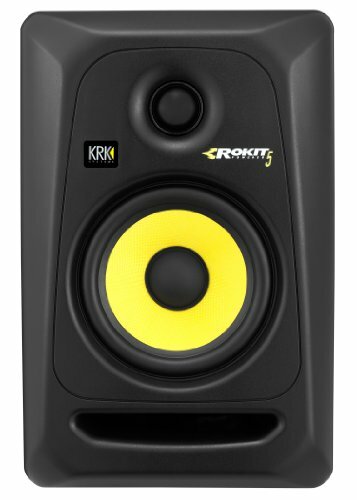 KRK’s Rokit studio monitors are the most popular choice for accurate monitoring. The Generation 3 Rokit 5 provides new waveguide optimized for superior imaging, new 1-inch soft-dome tweeters for pristine clarity, and 5-inch glass-aramid composite woofer for clear midrange and tight bass plus low and high frequency adjustment to tailor the sound for your room and mix! KRK designs these active studio monitors with a price to appeal to home studios and the sound to be used in the biggest professional studios. Hard to believe? Give them a listen and you’ll find out what producers and musicians have been raving about! The KRK Rokit 5 reference monitors raise the bar once again.